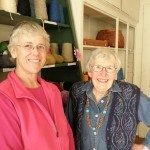 In 2005 Audrey Moore, who has taught Navajo style weaving here for 40 years, took over the Damascus Pioneer Craft School, changed the name to Damascus Fiber Arts School, and continued to teach. 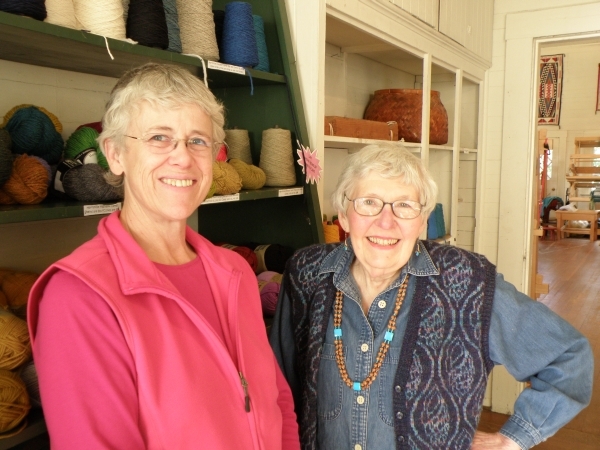 Terry Olson, once her student, now teaches alongside her, specializing in Tapestry Technique, woven on a variety of looms. Terry has been weaving for 25 years and teaching for 17 alongside Audrey at the school. Terry’s website is http://www.terryolsontapestry.com/. The school also offers classes in knitting, spinning, dyeing and Ravenstail twining. Weaving classes are held during the day, Tuesday and Thursday, 10am to 3pm, from October through June. Knitting class is Wednesday afternoon from 1-3pm (Knitting canceled due to illness). Spinning workshops will be on two Saturdays from 10am to 3pm. Two Acid Dye Basics workshops will be scheduled for two Saturdays most terms, beginning at 9am. Ravenstail twining continuing instruction for previous students will be held the first Wednesday of each month. For new students, two four-day workshops are scheduled for June and July. We have a small school shoppe that is open for retail business. We carry wool weft from Brown Sheep, Harrisville and Glimakra. We can order the Mirrix loom that you have been itching to get, along with Tex Solv heddles for it. We also sell weaving forks/combs by Al Snipes, brass-tipped bobbins from John Moss, other wooden tools, small copper looms, and Navajo style looms made to order. If we don’t have it, we will order it for you.